Indoor Enclosed Bulletin Boards with glass doors allow the world to look in on your hard work and impressive bulletins while keeping pesky hands out. We carry Wood Framed Enclosed Bulletin Boards and Aluminum Framed Bulletin Boards for indoor use. A large variety of these Indoor Bulletin Boards leave you with several custom boards to choose from. Indoor Bulletin Boards with Lights and deep enclosed bulletin boards offer new display options. Take advantage of nighttime displays, spotlighting memorabilia, and hanging jerseys in a deep display case! 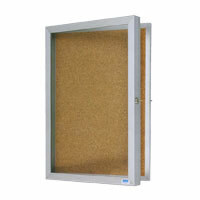 Indoor Enclosed Cork Bulletin Boards that lock hang easily with wall mounts. Headers for enclosed bulletin boards turn attention to your display and are sure to draw readers and viewers in.